Want to begin dispensing kegs of delicious Guinness® beer? Kegco's complete Economy Guinness® Dispensing Kegerator Conversion Kit is an excellent place to start! Unlike standard carbonated beers, Guinness® requires specialty equipment like a European "U" system keg coupler to tap the keg and a faucet with a restrictor spout to achieve the perfect cascading head. 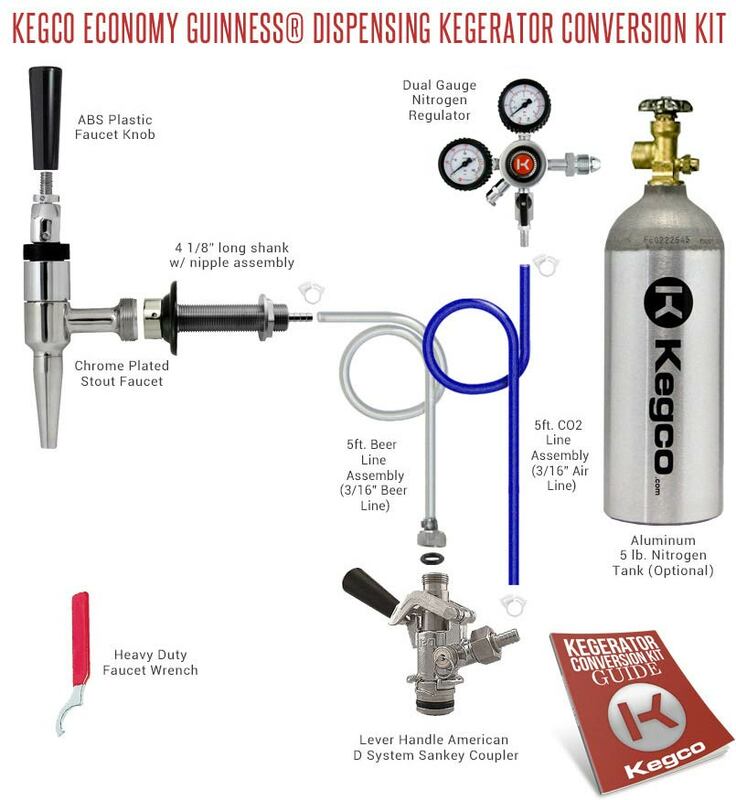 All of Kegco's conversion kits feature high quality parts that have been built to last and include detailed instructions, so you can build your new keg dispenser with confidence. In order to dispense Guinness®, you will need a mixed gas high pressure tank that can be filled by a local gas supplier. Once you have confirmed that you will be able to get the mixed blend filled locally, you have the option to buy our high strength aluminum alloy tank or purchase a tank from a local dealer. This European stout beer faucet features a restricted spout that contains a tiny disc. The restrictor disc helps slow down the pour and allows the beer to pour properly to achieve the cascading head that stout beer is famous for. It has a chrome-plated brass body and a stainless steel nozzle. The Taprite CH5300U U System Keg Tap Coupler is a coupler that is compatible with European U system kegs. To tap a keg all you have to do is pull out and then down on the lever handle to properly couple the keg. This coupler will work with brands like Guinness®, Harp Lager and Kilkenny, to name a few. This commercial grade dual gauge regulator is compatible with nitrogen cylinders with CGA 580 valves and features a double gauge design that measures both PSI and the volume of nitrogen gas in the tank. The durable regulator body is constructed of forged brass with all brass connections and components, an integral safety pressure relief valve that releases at 45 PSI, and a shut-off valve that allows you to instantly shut off pressure to the keg. A large pressure adjustment knob makes it easy to adjust the pressure by hand without requiring a screwdriver.